Good Early Morning To You All! Well, the journey begins! Getting off at 7:00 a.m. as planned and raring to go! Smiles on faces, Top Hat on Head, bags packed, craft supplies packed, and every other thing you can think of packed. Why is it that when you're going away you feel the need to take things you haven't used in like...forever! LOL! House-sitter sitting, dogs and cat hugged, everything is in place. What a great feeling....I'm off! So here starts the beginning of my journey to Hilton Head Island, South Carolina. First stop tonight, Alabama. Sunday, on to St. Pete for classes with Lady Dy, then onward to my favorite place to recharge and hang out...HH on Tuesday night! Yahoooo! So excited about this trip. Can't wait to meet some amazing folks along the way! Don't forget later today when we get cruising down the road, I want to start the My favorite Things Game! A great prize is in store! Bon Voyage To Me! :) (Can you say Bon Voyage to yourself when no one else is even up?) LOL! Sounds like fun! Have a safe trip. I can't wait to go on your trip with you!! Enjoy your JOURNEY and ENJOY your class time with Lady Dy!! You will love her classes!! Can't wait to take you on ,y virtual journey Chuewanita! Thanks! J. Have a wonderful trip!! I live about an hour and a half from HH (in Summerville, SC)....I ought to drop by and see you!! Haha!! Thanks Bbsox! I think I'm starting to figure out how to respond by iPad! Yahoo! J. Well, don't you look dapper, Mr. Jim, with your top hat and sneakers! Have a wonderful time, especially with Ms. Dylusions herself! I am so envious! Be sure and share with us pics of the workshop (if allowed). I'll be with ya in spirit (and via internet...lol)! Bon voya-gee! 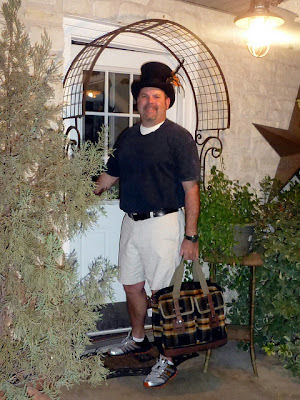 Tennis shoes and Top Hats, a novella by Jim Hankins....what do you think? My life in a nutshell! Of course I will share pictures. Thanks Miss Alice! Kay, we need to organize an art retreat in HH next year! Wouldn't that be awesome? Groovy! Kay we are only in Giddings so far! Had to stop and take some pictures. Onward to Houston... J.
Lookin pretty spiffy there Jim!....have fun, although it sounds like you do everywhere you go.....might have to check this place out someday....lord knows I need some recharging once in a while myself.....enjoy! Yes, you would love it, I promise! Hey, looks like you all in Canada will be freezing up your way tomorrow! How are the temps now? Enjoy the journey Jim! Share all you can with us! Can't wait to see your future ideas and projects! Sorry I dropped the "y" Becky Ann! Just when "I" was actually getting back into "real" life, you go on vaca. It has taken me over a month to get out of the vaca mindset(Disneyland will do that to you)and back to responsibilities. I sure hope I don't slip back into vaca head, but Jimbo have a good safe trip. Can't wait to experience it with you via the blog. Hubby and I are on the Island as we speak, but we have to leave Thursday - 10 hour drive back to West Virginia. Would have loved to have met you - you truly are an inspiration to this relative newbie. An artsy getaway next year sounds brill! But as I am a nurse and our scheduling is done waaay in advance -please, please, if you are going to do this (and I sure hope you will) let us know in good time! Wow would love to meet you! You can't fail to have a good time here on Hilton Head - so be safe getting here, and good luck with your crafting. What a place to craft! I have some supplies with me, but haven't had chance to use them - I suppose that's a good thing, right? Wishing you a safe, creative, fun and restful adventure! Safe travels. Have a wonderful time and Lady Dy a hug for me! Sure sounds like a wonderful journey - especially the part about taking classes with Lady Dy! Let the recharging begin!! Have a safe journey Jim. Looking forward to seeing your photos and hearing about your exploits! Bon Voyage Jim! Sounds like a fabulous trip. Getting inky wit Dy and then relaxing in HH. Will be watching for your favorite things. Count me in for a retreat in HH next year! You look like you're ready to PAR TAY!!! Have a safe trip!! Please give Dyan a hug from me!!!! Can't wait to see the travel adventure posts!! Jim, Have a WONDERFUL time, I love it when you take us all on a virtual trip. Next best thing to being there! Travel safe!! By the way...I am in Kansas, and it's 42 degrees here at noon-thirty. Great photo, you look like your raring to go! Was just at WhimSoDoodle last night, stocking up again! Didn't get in on Dyan's classes but may still be there. Maybe I'll get to meet you! Have a safe trip! Jim I know you will have a fantastic trip. The drive is the most unappealing part of a trip. I just got back from crafting class with Tim Holtz. So, so amazing. Will keep checking back to see your journey. I'm 4 hours from HH. So jealous you are on vacation. I am so ready for one. Hopefully we all can live vicariously through you. Have a great time as I know you will. Have a terrific trip! You look awesome. Look forward to sharing your adventures. Jim, glad to see you are starting out well packed for your trip (top hat is a must, I'm sure!) Dyan just left Kansas and she was fantastic! I loved every minute of her classes and wished I'd taken all of them. Even though it was just last weekend, I'm already jealous of your adventure with her. Enjoy your trip and I'm looking forward to your "on the road" posts. Have a wonderful and safe trip. Pack some warmer clothes, it ie supposed to drop in temps early in the week. Wish I was going on a trip. Have fun!! !